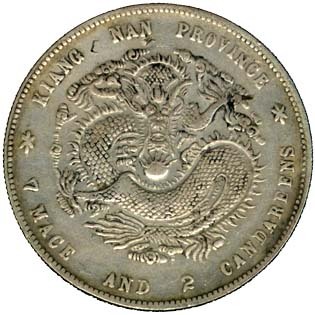 In 1889 the provincial authorities of Kwangtung issued Dragon dollars of 7.3 and 7.2 mace. During the circulation, a large numbers of 7.3 mace silver coins had continuously been collected or melted down by other provincial mints for its silver content. Although the 7.3 coins were driven from the market, the 7.2 mace silver coins proved satisfactory and were gradually imitated in other provinces. 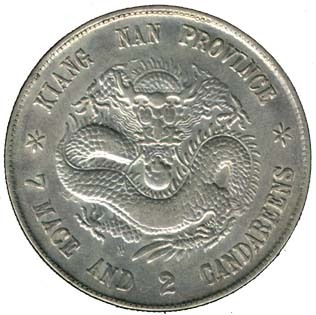 Kiangnan Dragon Silver Coins are the early follower of Kwanngtung dragon dollars. 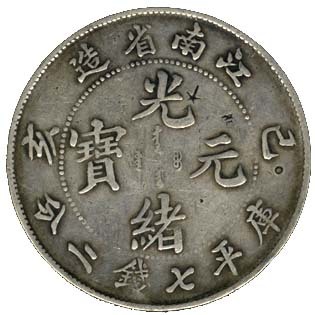 Kiangnan Mint first minted a complete set of five silver coins (including one-dollar, half-dollar, 20-cent, 10-cent and 5-cent) in the 23rd year of the "Kuang Hsu" reign (1897AD). I think Kiangnan silver coins were issued in small quantities and or they minted in a short period only, so that the surviving of old Kiangnan silver coins [ known as Lao Kiang Nan 老江南 ] became very rare today. 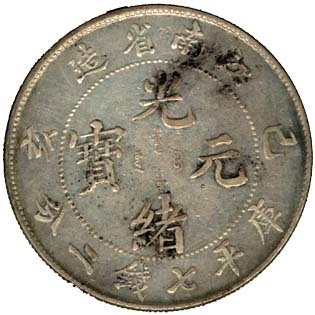 Kiangnan Mint coined another set of silver coins with their dates on the obverse in 1898. On the obverse of this coin, there are 4 Chinese and 4 Manchu characters, all reading as Kuang Hsu Yuan Pao in center, within a beaded circle. Four Chinese characters at top means "Made by Kiang Nan Province" and below are Chinese Characters means "Ku-Ping 7 Mace 2 Candareens". The Chinese character "Pao" is written in the proper way. The date "Wu-Hsu" (1898AD) taken from the Chinese sexagenary cycle were inscribed on the both sides of the circle. You can see clearly that there are two "Chop Marks" just above the date "Wu-Hsu". [This is a very common practice for Chinese merchants, they put these marks on the coins to show that they had checked the weight and fineness of the piece as suitable for use as money. Because the Chop Marks would cut through that surface to expose the color of the metal inside the coin. Chinese marchants would expose those being chopped copper coins with plated silver surface.] I think "Chop Marks" affect the value of the silver coin much, thought they can make the coin more interesting. But this all depends on how the individual collector feels. 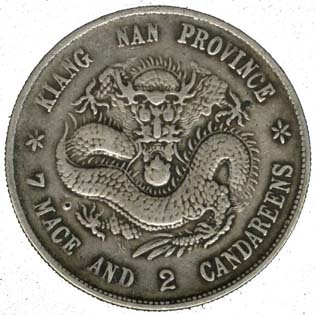 On the reverse there is a side view dragon surrounded by English characters "KIANG NAN PROVINCE, 7 MACE AND 2 CANDAREENS" and stars on the right and left. Please pay more attention at the fireball beneath the dragon's chin, you have hardly seen the 7 flames which normally appeared on the fireball of the Chinese dragon coins. This is a special design of coiled dragon pattern which I like it more. The design of this Kiang Nan coin is similar to the previous coin except the date "Chi-Hai" (1899AD). The dragon pattern design is known as Lao Lung 老龍 [means old dragon] by the Chinese collectors. About ten years ago, I wanted to pubchase a "Wu-Hsu" Kiangnan silver coin, because I knew that the "Wu-Hsu" coin was designed with a "Lao Lung" pattern which I like more. I asked the dealer whether he had the "Lao Lung" Kiangnan silver coin, he turned his head and tell me he did not have. Actually, he misunderstood that I needed a "Lao Kiang Nan" silver coin, but he showed me this coin later and promised to me with a special price. I was very glad to know this new pattern of Chi-Hai coin. Later I have not met this type of silver coin again in Hong Kong. According to the Chinese numismatic references, this coin is not a rare coin. It is strange why I cannot find it again. 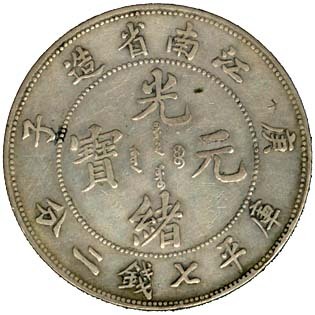 Actually, the Chi-Hai coin had been changed to a new design pattern in the same year (1899AD). "Lao Kiang Nan" is a very rare silver coin with the dragon pattern in a circle, minted in Kiangnan province in 1897. 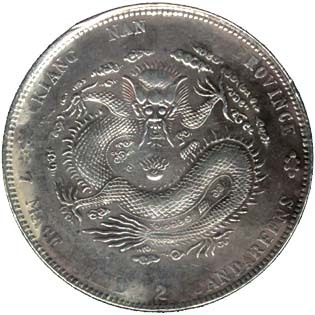 The design of this "Chi-Hai" (1899AD) coin is similar to the previous coin except the dragon pattern design (new design pattern). This coin was minted in Nanking Mint too. Perhaps you don't know where is the Kiangnan Province in China. Because Kiangnan Province was divided into 2 provinces "An-Hui" and "Kiang-Su" Provinces in the 6th year of the K'ang Hsi reign (1667AD). But Chinese accustomed to call An-Hui and Kiang-Su areas as "Kiangnan". Nanking Mint was established by Liu Kun-I, Nanyang Minister of Qing Dynasty in the 22nd year of the Kuang Hsu reign (1896AD). 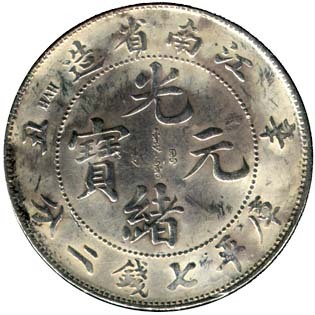 The Mint was known at first as Kiangnan Silver Coin General Mint; it was changed to the Mint Branch under Ministry of Revenue of Kiangnand in the 30th year of the Kuang Hsu reign (1904AD), in the 31 year (1905AD) it changed to Kiangnan Silver and Copper Coin General Mint, and changed to Mint Branch of to Kiangning Revenue of Kiangsu Province in 32nd year (1906AD). It also changed to Kiangnan Mint under Ministry of Revenue in 1907. At last, it changed to Kiangning Mint Branch under Ministry of Revenue in 1911 or the 3rd year of the Hsuan T'ung reign of Qing Dynasty. This coin was minted in the 26th year (1900AD) of the Kuang Hsu reign of the Qing Dynasty. This coin was struck same as other Chinese dragon coins in 5 denominations including 7.2 mace, 3.6 mace, 1.44 mace, 7.2 candareens and 3.6 candareens. The design format is similar to other Kiangnan silver coins. 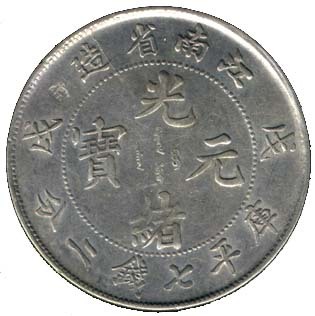 The center of the obverse bears the name of the coin in Chinese and Manchu characters, [The Manchu scripts bearing in the center sometimes are large, like this coin and sometimes are rather small, like the above and below coins, you cannot see them clearly] with the name Kiangnan Province above it and face value below it, and the date ("Keng-Tze" means 1900AD for this coin) flanking on both side. 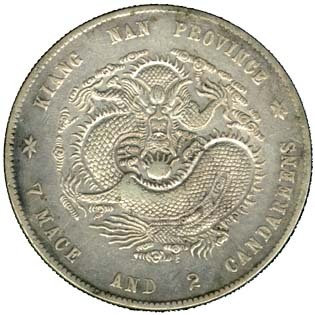 The reverse bears a different dragon pattern in the centre, the mint name, the face value and 2 decorative stars around the central dragon pattern. Kiangnan dragon coins always have different editions in dragon pattern design, even those were minted in the same year. This Hsin Chou (1901AD) Kiangnan silver coin had been improperly cleaned with some acid by the hawker before it was sold to me. This is a typical example of cleaning coins the wrong way which have reduced its value significantly. The hawker thought that a coin in "newer" condition is worth more than an old, dirty one. When the hawker found that a bright old coin does not look natural at all, he put some Chinese ink on the surface of the coin. It is doubly pity that it look even worse as it was placed before me.